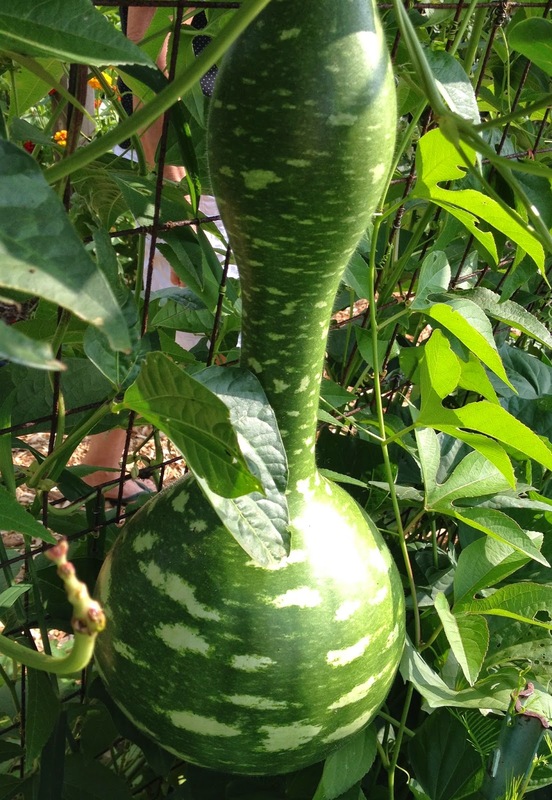 Another view of one of the many beautiful gourds from the one volunteer plant that has taken over multiple yards of space at the Derwood Demo Garden (do not plant this in your 100-square-foot plot!). There are so many enormous gourds on the fence now that it’s falling over; we had to prop it up with stakes. 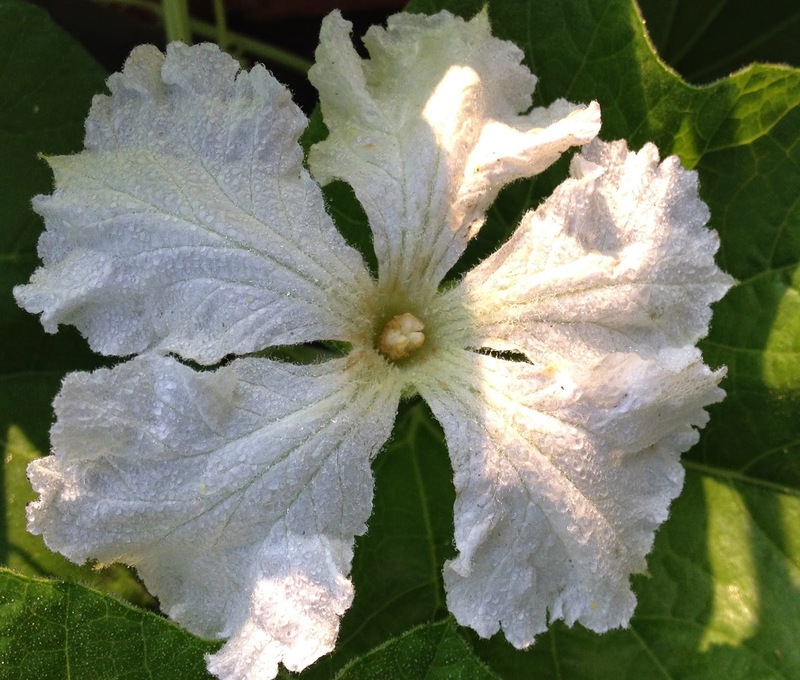 It’s a species of gourd that has white flowers, open only early in the morning. 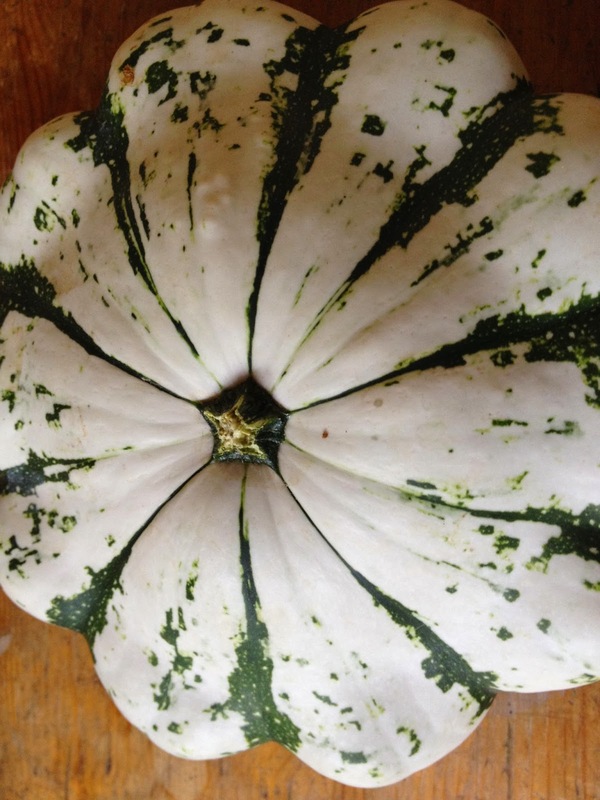 This is a scallop squash called Patisson Panaché Vert et Blanc. It’s very lovely, but I found it when it was rather on the mature side, which is when it develops its finest coloring but has a tough skin and big seeds; you should really pick them at about three inches wide and still pale green. I also discovered at the same time (a few days after thoroughly exploring the plants, I swear) three yellow crookneck squash that had turned almost orange and hard as a rock on the outside. None of these seemed likely to have the best flavor for baking like a winter squash, and the insides were still tender, so what I ended up doing was laboriously peeling them, scooping out the seeds, and then grating the flesh in a food processor. I also grated (in my first experiment) a sweet potato, and (in the second experiment) some onion and mildly hot pepper, mixed the vegetables up with an egg (or two if needed to moisten everything), salt and pepper, and a few tablespoons of chickpea flour, along with a tablespoon or so each of sesame seeds and flax seeds, for a protein and flavor boost. Then I made the mix into patties and fried them in oil. Both times we ate them with a salad containing beans (out of a can – don’t have my own dried beans yet) and delicious homegrown tomatoes. This is a very good year for discussion about what to do with all the squash – but summer squash that’s a bit past its prime is a different challenge than huge zucchini that are still tender all through. Some years I’ve just grated the flesh, stuffed it in bags and stored it in the freezer until I got inspired! ← Grow It Eat It is everywhere! love the comparison pics of the flower and the squash! Fibonnoci would enjoy them.